From transportation simulation to fixed wing aircraft simulation and rotary wing aircraft simulation, the multiple stresses that shock and vibration testing puts products through allows product managers, reliability engineers and manufacturers to determine whether their products are able to perform in a host of challenging environments and conditions. Furthermore, both a shock test and vibration test are useful — and even required in certain industries — to discover issues such as the production of noise, heat or breakage due to the absorption of energy from mechanical vibrations and sudden shocks. In both shock and vibe testing, the result of knowing how a product and its performance will be impacted by adverse conditions means that manufacturers don’t rush to market with an inferior product that can result in costly warranty claims, litigation issues — or worse — a catastrophic failure in a mission-critical situation. Instead, vibration and shock testing pinpoint products’ limitations so that changes and modifications can be made and a more robust product is eventually brought to market. It’s important to remember that the intense combination of vibrations and shocks can quickly result in the loosening of electronic connections and fasteners as well as lead to greater-than-normal wear and tear. Again, by addressing these issues while still in the design, development or production stages, manufacturers can produce best-in-class products that are strong enough for even the most rugged applications. Vibration test systems and vibration testing equipment have developed greatly over the years. Just consider the acoustic environment of a rocket booster during takeoff, and you’ll quickly understand why companies in the business of vibration testing have worked hard to meet organizational standards — like those of NASA — to replicate the mechanical forces new products are expected to endure. 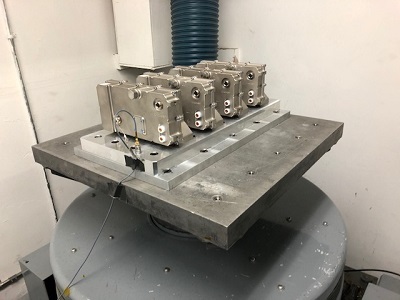 Fortunately, with Quality Testing Services (QTS), you can gain access to not only cutting-edge vibration test tables and vibration step stress test facilities but also our more than 20 years of experience in the business to help guide and advise you through the entire testing process. Since we’re often asked about which vibration test is right for a particular product, let’s take a look at some of the most popular vibration tests and what each one reveals. Initially, most vibration tests were a sine sweep in which, over varying frequencies, a single sine at a time was applied to the test product. Sine sweep testing with the aid of tracking filters is still especially useful in finding resonant conditions on electrical components and PCBs as well as their housing. Since both individual components and circuit boards generally have distinct resonant conditions, a sine sweep test is often the most useful in pinpointing and producing some of the most stressful and damaging circumstances a product will encounter during its lifetime. Resonance search and dwell tests track a product’s resonance frequency and automatically adjust the frequency excitation to carefully measure subsequent shifts in resonance. This method is highly useful in measuring fatigue in high-cycle components, such as crankshafts and turbine blades. 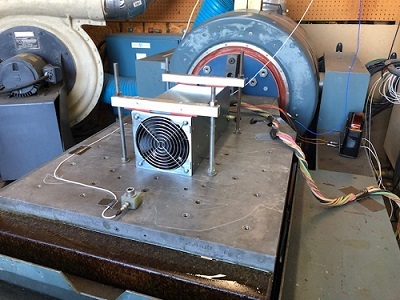 A random vibration test takes all frequencies within a specified range and applies them to the test piece all at once to replicate real-world applications. For this reason, random testing can excite all frequencies of resonance at the same time. As a result, for automotive, aeronautic and military applications especially, random testing delivers a high level of stress screening. Shock testing involves subjecting a test piece to a sudden, short and relatively high level of force. These tests are designed to replicate conditions that products may encounter while they’re being handled or transported or when they’re at their eventual service location. In addition, certain shock tests are required to simulate very specific conditions, such as enduring military grade shocks like those encountered aboard warships or felt throughout the launching and landing of military equipment. It should be noted that for just about all military applications, there’s a MIL-STD guideline to follow. During the creation of mechanical shocks, a test piece is subjected to extreme, sudden and high amounts of deceleration and/or acceleration. Highly sensitive gauges measure the strains on the product, and the collected data allows engineers to analyze whether the product meets their performance expectations. Everything from drop testing to replicate accidents in handling and transport to the use of pyrotechnics to simulate proximity to weaponry firing can be carried out under strict testing conditions. Unlike other shock and vibration testing companies, QTS offers you more than the latest testing methods and equipment. We’re also proud to be a company that collaborates with our clients to find the solutions and values each one is looking for. If you’ve been cycling through other testing companies, give us a try. We’re confident that you’ll be pleasantly surprised by our expertise, flexibility and ability to meet both your deadlines and budget. With more than 20 years in the testing business, we appreciate what it means to be listened to and treated well. That’s why we forge long-lasting relationships with our clients — regardless of whether they’re located in Southern California, elsewhere in the U.S. or overseas. We’re always happy to supply you with a free quote or have a conversation about your requirements. And best of all, we’ll customize our services to match your product and testing needs. Get the service and attention you deserve. Fill out our contact form or call 714-903-1155 to discover how QTS combines all the best qualities of a testing service under one roof.